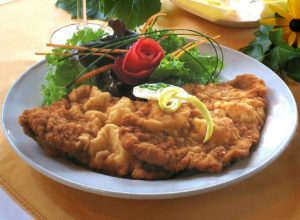 Schnitzel is an important part of Viennese cuisine. It consists of meat fried in breadcrumbs, a common food known in other countries by different names, such as cutlets or escalopes. 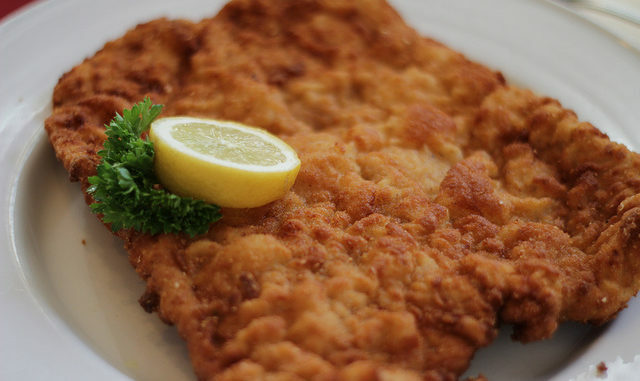 Pork or chicken schnitzel are some of the variations you can find in Vienna, but the most common is Wiener Schnitzel. Made from veal, it’s a national dish of Austria. Schnitzel is traditionally served with a simple salad made from lettuce with a vinaigrette dressing (called Kopfsalat), or potato salad. These days it’s often accompanied by french fries, or perhaps rice, but pouring any kind of sauce on the top is considered sacrilege! In Vienna, you can try a wide variety of schnitzel, from homemade-style meals to giant servings of Austrian comfort food. Below are the restaurants and cafes that serve the best in the city. A list about schnitzel wouldn’t be complete without the restaurant that’s the most famous and most popular for it. It started out as a family-run heuriger, or wine tavern, near St Stephen’s Cathedral, and it has now been serving schnitzel for over a hundred years, and into the family’s fourth generation. 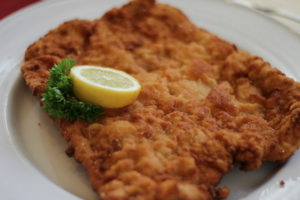 The schnitzel itself, which is actually pork-based, is huge, thin and crispy. It’s served with a choice of 12 different salads – if you can fit in anything else – by smartly-dressed waiters in tuxedos. Without sides, it will cost you €14.90, but it really is a full meal in one! There are two locations, in Wollzeile and Bäckerstraße, but whichever you go to you’ll have to reserve a table or be prepared to queue! This Leopoldsgasse-based restaurant is another place that gets plenty of mentions for its schnitzel. Although it doesn’t have the same history as Figlmüller (it opened in 2006), it does do an excellent traditional schnitzel. Echoing the older establishment’s waiters, the whole restaurant is classy, down to the tableware. While its seasonal menu is high quality, too, the focus here is on the schnitzel. Lighter than some, you stand a chance of actually finishing the potato or cucumber side salad, even though the portions are still big. The meat melts under your fork inside a perfectly crisp coating. It’s a bit more expensive, at €19.50, but that doesn’t stop the restaurant from filling up. 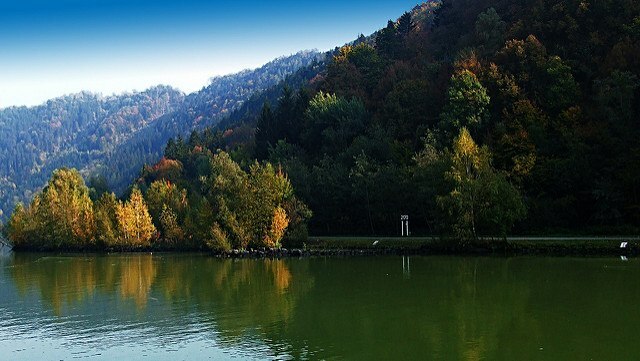 Reservations are recommended for Skopik & Lohn as well. It doesn’t get much less expensive at Pfarrwirt, which claims to be the oldest tavern in Vienna. Located in Pfarrplatz, there’s plenty to recommend it, from the garden seating in summer to the warm welcome in winter. There’s a chicken schnitzel with potato salad on the menu, but the star of the show is the veal. The Wiener Schnitzel here is worth its €19.80 price tag, with a truly satisfying crunch to the coating, and delightful air bubbles made by the batter. It would make the perfect location for a special meal; if you have one in mind, reservations can be made online. At Pürstner you can expect a more down-to-earth experience; they serve traditional Viennese food in a cosy, rustic atmosphere. Large wooden tables that seat 120 fill the halls of this family-run business on Riemergasse, adding to the informal feel. The food is simple – veal schnitzel served with potatoes (€17.20), and pork schnitzel with potato salad (€12.70) – but satisfying, and as crunchy as you’d hope. Again, book ahead, especially if you plan to come here for dinner. Pöschl may be small, and its decoration may be basic, but the tavern’s heart and soul are poured into their Wiener Schnitzel, which is accompanied by potato salad. Local cheeses and heart-warming soups round out the menu for anyone who fancies something different. Centrally located, in Weihburggasse, it’s no surprise that it fills up fast. You’re in competition with the locals for this one, so make a reservation or miss out! The pub-like Brandauers Schlossbräu is known for its spare ribs, but it also does a tasty line in schnitzel – not veal though, just pork and chicken. The microbrewery has a good selection of beers to enjoy alongside your meal, which can be eaten out in the courtyard when the sun’s shining. What’s more, it’s conveniently located near Schönbrunn Palace. On Hamburgerstraße is another place full of history, which has been serving locals for over 100 years. The café/restaurant has a traditional interior; a visit here almost feels like going to see your doting grandparents. If it feels too old-fashioned, there are tables in the beautiful garden which has views of the river. 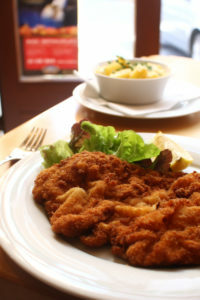 They offer pork, and veal schnitzel, which both come with potato salad (€8.60 and €14.90 respectively). It’s fried in lard, giving it a particularly light texture. The last entry (but not the least), is characterised by its cheerful atmosphere. Located on Engerthstraße, it has a self-proclaimed “legendary” schnitzel menu, with their own original variations on the classic dish. The mixed platter for two is a great choice for the indecisive, but you may need another person to help you finish it! The traditional Wiener schnitzel is €16. While you’re waiting for your food, there’s plenty to look at, as the restaurant is covered in souvenirs and knickknacks. Whatever dining experience you prefer, Vienna has somewhere for you to try the best schnitzel it has to offer. Whether it’s a traditional veal schnitzel, or something a little different, you can find the most delicious ones in classy restaurants or informal taverns. Just remember to work up an appetite first!